My favourite scene of all in Only Fools and Horses has the two Trotter brothers in their trusty van, driving through the French countryside. Del professes his love for duck a l’orange and asks Rodney: “how do you say duck in French bruv?” Rodney pauses then replies: “it’s canard Del.” Try saying it out loud if you don’t get it. And so it is with predicting the winner of the European Championships which commence later tonight in France with the hosts taking on Romania. The French are many people’s favourites and that’s understandable given their strong and balanced squad plus home advantage. Since hosts don’t have to qualify it’s always difficult to assess their form ahead of a tournament. The ease with which they beat Scotland last week told us more about our travails than French prospects of triumph. We Scots have been looking on with envy as the rest of the home nations have crossed the Channel to do battle against Europe’s best. And Albania. Indeed, the last time we made it to a major tournament was in France, the World Cup of ’98. I was still a teenager, with a Kurt Cobain poster on my wall, and had recently moved to England. The Scotland team did as usual: almost beat Brazil then exited meekly. We had a tough qualifying group for France ’16 but we still should have edged out the Irish for a play-off spot. I expect most of the home nations to return home pretty quickly with the exception of England. I don’t think they’ll win it (they don’t look like a squad who could handle the pressure of going all the way) but it wouldn’t surprise me to see them in the semi finals. England are suspect at the back, which is true of most teams in the competition, but they have considerable talent and options up front. Personally I wouldn’t start Rooney but Hodgson will and the balance of the side will be disrupted as a consequence. I see some of the England fans have already been making friends and influencing people. They’ve been on the receiving end of some tear gas and more tears will surely follow when the inevitable defeat on penalties comes to pass. Elsewhere, the Spanish and the Italians both arrive somewhat uncertain and potentially underestimated. Conte will squeeze every ounce of sweat out of his side but he lacks a really menacing goal scorer. The Spanish are trying to evolve their tiki-taka style in the absence of Xavi, the man around whom the whole system once revolved at both club and national level. Belgium are ranked highly but I’m not convinced they’re ready to breakthrough and actually claim a title. My tip then is the Germans. Betting against Germany rarely pays dividends and I don’t recommend it on this occasion. They were poor against Scotland twice in qualifying but they have quality throughout the spine of their side and, more importantly, they know how to win. It promises to be an exciting month and for those of us watching from afar, a tiring one. Many of the games kick-off at 3am Malaysian time. I’m much older than a teenager now, so I’ll have to pace myself. The great Xavi Hernandez recently gave an interview to the BBC (you can find it here http://www.bbc.com/sport/0/football/30058904) in which he spoke about his style of play and his favourite British players among other things. Perhaps more than anyone else, Xavi has become synonymous with the so-called tika-taka style, based on short passes, constant movement and understanding of space, that Barcelona have made famous in his time at the club. I’ve been privileged to watch Barcelona live three times (two of those games were competitive league fixtures). When I’m telling the grandkids about it someday they’ll likely be awed by the fact that I saw the magnificent Messi, and rightly so, but every time I’ve seen Barcelona Xavi has been the most important player on the park. If Messi is the virtuoso violinist in the Barca orchestra then Xavi is the conductor. He sets the tempo and the pace and can vary it at will. It’s an extraordinary skill and incredible to watch. If genius exists primarily in simplicity (and I think that’s by and large true) then Xavi is the smartest player on the planet. “I’ve been a passer since a young age,” he tells the BBC and it shows. Schooled at Barcelona’s La Masia academy since the age of 11, he learned his lessons well. The first time I saw him live I think he gave the ball away once in the entire ninety minutes. To do that while playing simple passes to your full backs is one thing (and he does some of that) but to do it while playing all kinds of inventive ones such as Xavi also does is something else altogether. He looks for space more than any other player I’ve ever seen. He has an extraordinary awareness of space and he finds it more regularly than seems possible. He does it all with remarkable composure, seemingly never hurried. 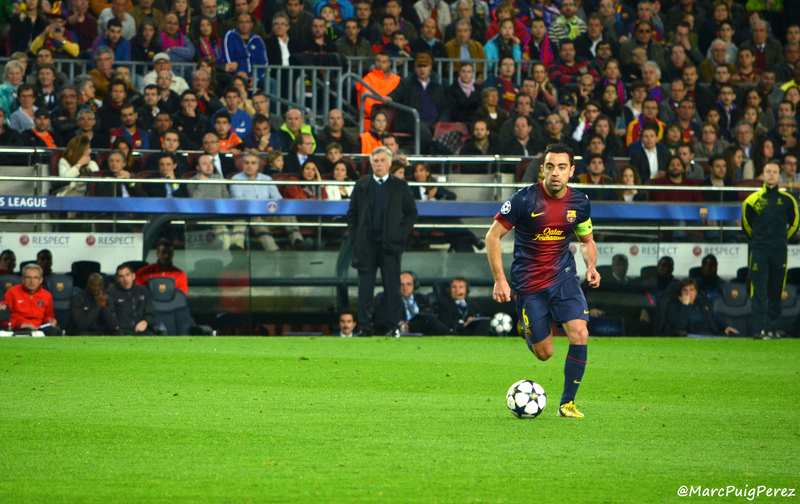 I don’t think Xavi has ever made a pass just for the sake of it. It’s always been with the intention of finding space, to clear a path to goal. If he can’t find the space he’s looking for he’ll aim to keep the ball – perhaps by playing back to one of his defenders – and then move and demand it back to resume his search. Alex Ferguson had the best description of Barcelona’s passing style: “they get you on that carousel and they leave you dizzy.” That’s what they did to Ferguson’s team in the 2009 Champions League final in Rome. The sides met again in the final two years later at Wembley. Before the game Ferguson claimed that he’d figured out how to stop the carousel but if anything his players came off even dizzier than in 2009. Xavi is the man that makes the carousel spin. He’s done it for Spain and for Barcelona, winning every honour in the game. Messi is justifiably hailed as the best player in the world and arguably the greatest of all time but Xavi has surely been the most influential footballer of the last decade. In the BBC interview he says that his favourite British players when he was growing up were Barnes, Gascoigne, and Le Tissier. Each of them had incredible awareness and each of them knew where to find space on a football pitch. None of them found it as instinctively as Xavi though. He’s 34 now and retirement probably isn’t too far off. 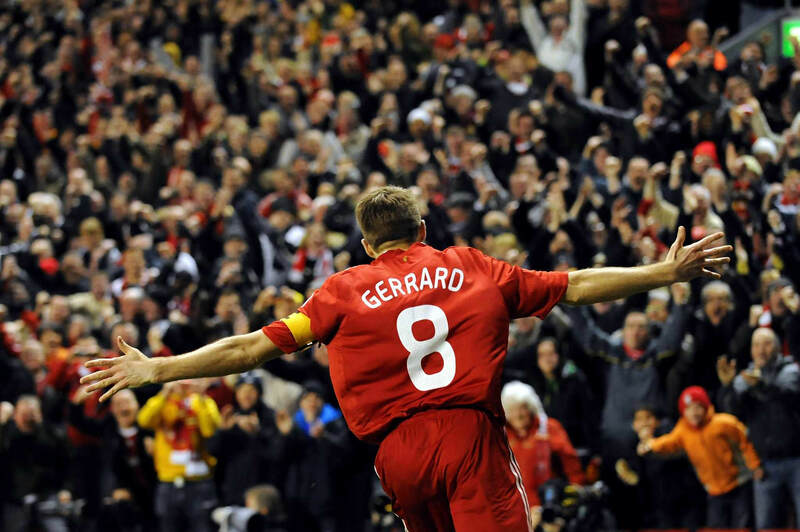 When he does leave the field for the last time, he’ll leave behind a space that will be almost impossible to fill.